Thon Maker and Jabari Parker. THON Maker's incredible playoff surge continued in the early hours of Monday morning (AEST) as the Milwaukee Bucks completed a 104-102 win over the Boston Celtic to level their first round series at 2-2. The young Aussie had five blocks off the bench - backing up the five he had in Game 3 - and contributed eight points and two rebounds in his 30 minutes off the bench. Maker becomes the the first player with five blocks in back-to-back playoff games since DeAndre Jordan in 2014. "He's the reason this series changed," All-Star Giannis Antetokounmpo told reporters post-game. And while it's irresponsible to give Maker all the credit - Antetokounmpo and Khris Middleton combining for 50 points, including a game-winning tip-in for the Greek Freak - there does seem to be a relationship between Maker's minutes and success for Milwaukee in this series. Over the first two games of the series - two losses - Maker played just one minute total. Over games 3 and 4 - two wins - Maker has notched nearly an hour of court time. And while the Aussie big is likely too locked in to think about the bigger picture; this postseason display could prove vital in Maker's NBA future. After a less than inspiring regular season, doubts were rising and minutes were falling for the 21-year-old who was selected with the No.10 pick in the 2016 draft. But if Maker continues to put in these sorts of performances, he could yet live up to the Bucks' lofty expectations. 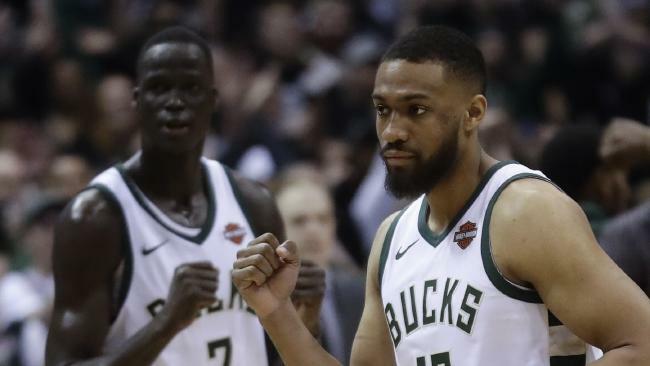 Giannis Antetokounmpo scored 27 points, including tipping in the go-ahead basket with 5 seconds left, and the Milwaukee Bucks beat the Boston Celtics 104-102 on Sunday to tie their first-round playoff series at two games apiece. Boston's Marcus Morris missed a 14-footer at the buzzer with Khris Middleton's hand in his face to seal a nail-biting win for the Bucks. Seconds earlier, the 6-foot-11 Antetokounmpo jumped and reached up with his left arm around Boston's Jayson Tatum to put back Malcolm Brogdon's missed layup for the game-winner. Game 5 is Tuesday night in Boston. Jaylen Brown had 34 points for the Celtics, while Tatum added 21. Tatum's 18-footer with 52 seconds left gave the Celtics a brief 100-99 lead. He just couldn't hold off Antetokounmpo on the other end for the decisive tip- in.